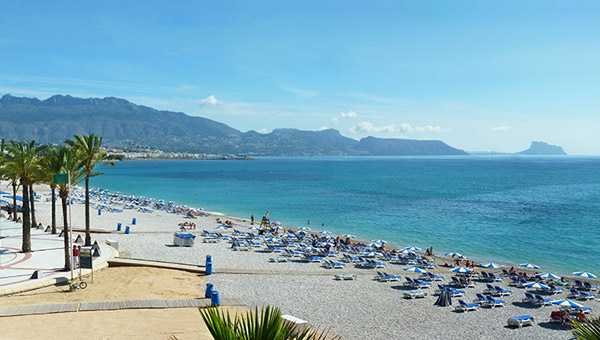 The beach in Albir is an amazing white pebble beach that stretches all the way to Altea. The seafront promenade, “Paseo de las Estrellas” (Boulevard of the stars) have actors and actresses names inscribed and is linked to the yearly film festival that bring celebrities to town and film viewings outdoor on the beach and in the theatres. Many nationalities are represented in this area and you can feel that in the environment and taste it in the cuisine in the many restaurants and bars along the playa and in the town. 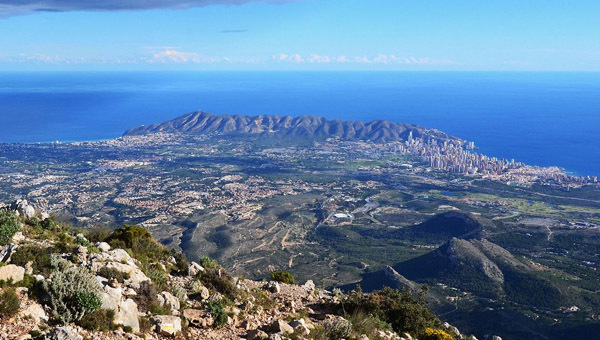 This area is nestled in between mountains and sea, and borders to Benidorm and Altea. 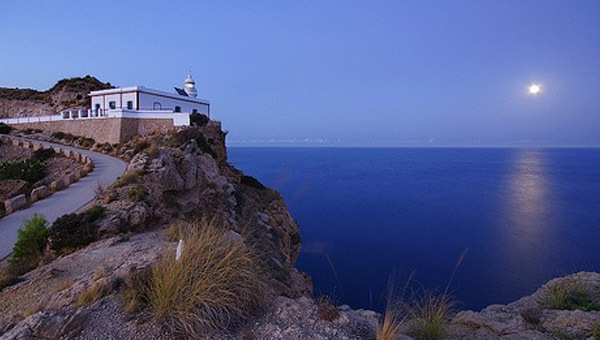 The playa also brings you directly to the path up to the lighthouse (faro) of Albir/Alfaz. A popular paved walking trail where you can enjoy amazing views, changing scenery and breathtaking sunrises and sunsets. The trail is paved so it is easily accessible. Saturdays and Sundays are great to spend at the market between Alfaz/Albir and Benidorm. Live music, cold drinks, freshly made paella, antiques and used goods. Good entertainment and the possibility for a good bargain. The name of Altea comes from the Greek name of 'Altahia', which means "I cure". The picturesque white village is situated beside the estuary of the River Algar, ("the river of health"). 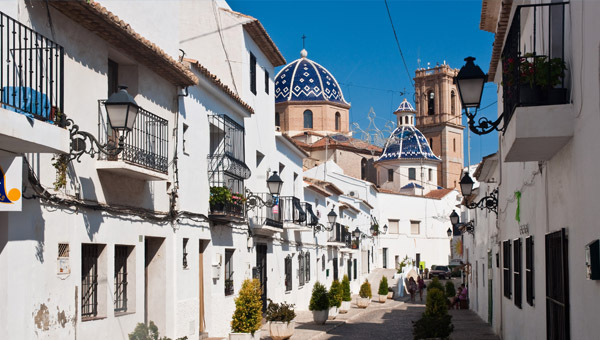 With its cobble stoned streets and whitewashed houses descending down to the seam Altea is a tranquil and beautiful village. It stretches down to the fisherman’s quarter which is now enlivened by a seafront promenade and a port, keeping the town busy and full of life. At the highest part of the town lies Plaza de Nuestra Señora Del Consuelo. From here there are spectacular views towards El Peñon de Ifach in Calpe to the north and Benidorm's skyscrapers to the south. At the heart and centre of this plaza the church is situated with its unique blue and white tiled cupolas. Artists show their pictures along here on the summer evenings, and it is a nice place to relax or enjoy a paseo (evening stroll). Over time and history Altea has been influenced by the Iberians, Muslims, Phoenicians, Romans and Greeks. Spread around in the many narrow streets of the old town you will find a variety of small art galleries and shops. These reflect that Altea for years have been a haven for artists, writers and musicians. Altea is the “Cultural Capital” of the Region of Valencia, because of all the cultural assets: Public and private Art Galleries, foundations of prestigious painters, 25 years of Moros y Cristanos celebrations,- a library, craft exhibition, conservatory, music bands, a fine arts faculty and the Palau Altea, which has a seating capacity of almost a thousand and hosts exhibitions, conferences, concerts and theatre performances at the highest level. This great city offers a complete range of services and facilities to accommodate the millions of foreign and national tourists that visit the city every year. 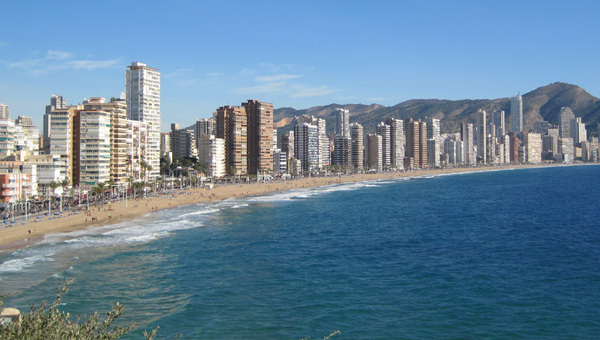 The city is divided into two halves, Poniente and Levante, with long sandy beaches. The beaches offer countless of cafes, bars and terraces for snacks and drinks where you can relax and enjoy the atmosphere, views and climate. The island of Benidorm is facing these two beaches, serviced by ferries so you can visit this uninhabited island which is set as a dramatic centrepiece. Around the island the clear blue waters are full of fish and marine life. The shore is spread over a total of 5 kilometres, and gives a beautiful view of the Alicante coast and the sea. The rocky promontory, Canafali hill is dividing the two beaches. The old city occupies this promontory. With its old charm and cobbled streets you have an array of establishments to choose from when it comes to shopping and dining. The old city also houses the traditional tapas bars. The old part of Benidorm have managed to keep its distinctive character amongst the forest of tower blocks to the east and west. Benidorm is a 24 hour experience which by night is lit up by a great monumental geyser of water and light that rises up from the seafront. You can choose from more than 50 fiestas every year in this vibrant city. In past times an old fishing village, now a tourist magnet with a beautiful sandy beach and many offers. 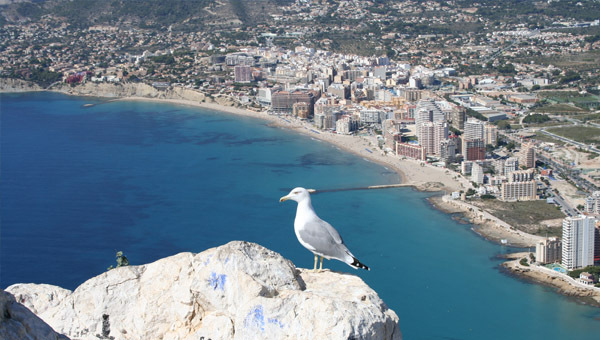 Calpe is recognised by the cliff and nature reserve Ifach. The top can be reached by a tunnel through the cliff. From here you have a fantasitc panoramic view. On a clear day it is possible to spot Ibiza. Calpe has a great mix of old Valencian culture and modern tourist attractions. A perfect blend that make it pleasurable to go out to discover or enjoy life in one of the sandy beaches. When it comes to sightseeing, the old town centre who is close to the arabic quarter is a good place to start. The old walls and the church "Iglesia Vieja" is well worth seeing. This church is the only remaining in the Mudjar-gothic architecture in the Valencia region. 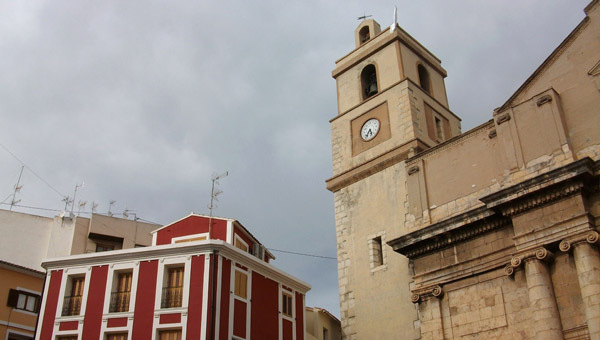 In the centre of Calpe you will also find the Archeologial museum and the Fiesta museum. Calpe has a wonderful modern marina that is siutated close to hte old fishingharbour. From here you can catch a boatride around the Calpe Cliff and to Benidorm. A good tip to catch a glimse of the coastline and local spots is to take the train the goes between Alicante and Denia, it stops both in Calpe and Altea/Albir. Dive in to history. 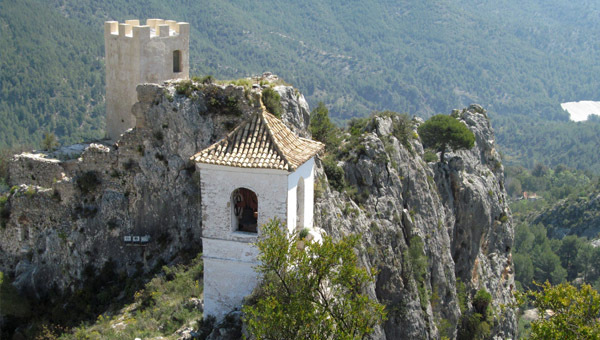 Guadalest is set on the top of a mountain peak and is quite a sight. With the houses set into the rock, overlooking a deep valley where the Guadalest river runs through. The town is divided in to two districts and is listed as a historic-artistic complex. The Arrabla, or modern quarter, extends around the skirts of the mountain. The castle quarter can be reached through a tunnel in the rock, and the castle itself hangs over the peak, protected by an ancient wall with a Medieval appeal. There is a wide variety of arts and craft shops and some restaurants to choose from. Make sure you do not miss some of the other attractions as well like the museum of miniatures. The town of Polop is spectacular as many of the neighbouring towns and villages in the district. With its famous fountain Els Xorrets, with 221 spouts, and an acient castle set on a nearby hill, and a famous antique market it has much to offer those that wish to explore. It was in this town that the spanish writer Gabriel Miro found inspiration. La Nucia lies on the flatter land at the feet of the Forques mountain. 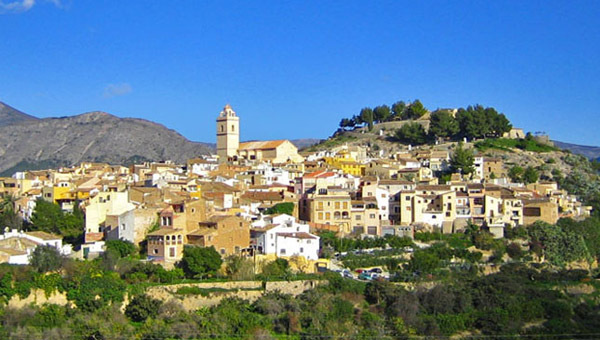 Among the attractions in town, the Renaissance church and Font de Favara are well worth mentioning. This is the land of fountains, waterfalls and the medlar fruit, or loquat. The Catholic church of San Juan Bautista, built in the 18th century sits on the highest part of the historic town centre. The Algar river flows over rough terrain and forms a waterfall at Fuentes de Algar, a popular place to visit. You can also at the top of a nearby mountain go to see the Fortress of Bèrnia, built in the 17th century to defend the city from pirates and Moriscos. The geography in this picturesque pueblo of the Marina district ranges from 0 to 1406m in altitude. Lying just a few kilometres from the coast, Finestrat gives visitors the chance to swim in its crystalclear sea and then climb almost 1.5 km to nearby mountain peaks. There are lots of scenic areas and a quaint town centre with houses painted in blue, ochre and sienna. Be sure to make a visit. Alfas del Pi is a quiet, inviting town on the Mediterranean with beautiful beaches and mountains. The fantastic natural surroundings and the mild climate have convinced many people from abroad to come for holidays, or even settle here.